We offer the two top termite treatment systems on the market today! Request a call to schedule your termite evaluation and get a free cost estimate for treatment. Or give us a call at 1-855-239-9059. Each year, termites cause billions of dollars in damage. This damage typically isn't covered by homeowners insurance. This is why proper termite control is a must. Offering dependable pest control service for more than 25 years, Cowleys Pest Services offers top-of-the-line termite control solutons, so that you can rest assured that your New Jersey home is protected from termite damage. Contact us today to schedule your termite inspection and estimate in Mercer, Ocean, Monmouth, Middlesex County, including Edison and surrounding areas. "I don't need new gutters, but I am interested in gutter cleaning twice a..."
I don't need new gutters, but I am interested in gutter cleaning twice a year. "We didn't realize that this service call was an "automatic" one..."
We didn't realize that this service call was an "automatic" one. Fortunately, someone was at home whenthe service person arrived. "Very professional employees. Trained well." Very professional employees. Trained well. "scott and todd were terrific"
"Chris Morgan is awesome! Very professional, explained what he was doing..."
Chris Morgan is awesome! Very professional, explained what he was doing. He is an asset to your company. "Suggest you modify email's to clients, most of mine went to spam, and I..."
Suggest you modify email's to clients, most of mine went to spam, and I have done business with you May of this year. "Todd is an outstanding employee who has solved several pest problems at..."
Todd is an outstanding employee who has solved several pest problems at our home he is professional, efficient and a gentleman. "Please return to spray outside perimeter of home for bugs...was not done!" Please return to spray outside perimeter of home for bugs...was not done! "first time using your company and it was a good experience-had a lot of..."
first time using your company and it was a good experience-had a lot of ants and now I don't:) I decided on a 3x yearly contract as it was more reasonable than the one time extermination. "From beginning to hopefully the end, I couldn't be more satisfied with..."
From beginning to hopefully the end, I couldn't be more satisfied with Cowleys. "Not only on time but a bit early! Very friendly and professional." Not only on time but a bit early! Very friendly and professional. "You guys are very professional and know exactly how to take care of..."
You guys are very professional and know exactly how to take care of problems. "I was extremely satisfied from the minute I reached out, and continue to..."
I was extremely satisfied from the minute I reached out, and continue to be even as I fill out this survey! Your website is informative and impressive, Kathy was very professional, helpful, and accommodating. Chris was very professional, friendly, experienced, and neat. Top notch customer service!! Thank you for being a pleasure to do business with! Your men do a great for me,.very happy with your service. "Anthony made a condition that was most disturbing one that we knew he..."
Anthony made a condition that was most disturbing one that we knew he would handle. I selected your company from the internet, the choice was more than satisfactory. How can Cowleys eliminate termites from your home? At Cowleys Pest Services, we care about your family's health and property as well as our environment. Our expertise in termite extermination and control combined with the most trusted and advanced termite treatment products available ensure that you're getting the best immediate and long-term termite protection for your home. If termites return within 90 days after the final inspection, we'll retreat your home at no extra cost. If we can't solve your termite problem within 90 days after the last inspection, we'll refund your last service payment. Swarmers (young winged termites), or their discarded wings near windowsills and doors (especially in early springtime). Mud tubes built by subterranean termites between the soil and any wooden part of the structure. Mud tubes are typically found near the home's foundaton. Blistered pieces of wood or wood that sounds hollow when tapped. Wood-colored droppings that look like sawdust. Termites are small, soft-bodied, and usually pale-colored. The antennae are relatively short, straight, and thread-like or beadlike. Flying forms have two pairs of wings of equal length. The wings are often much longer than the body; however, short-winged forms also occur. Unlike ants, termites never have a constricted “waist” or elbowed antennae. Often, homeowners first encounter termites when the young reproductives swarm from the nest. The first question homeowners want to resolve is what they dealing with – termites or flying ants. Ants have a narrow, wasp-like waist (more "cinched" in the middle of the body). Termites do not have a defined waist. Ant wings are about equal to the body size, with the fore and hind wings of unequal length. Termites have four wings of equal length that are nearly twice as long as their bodies. Ant antennae are L-shaped, with a "bend," while termite antennae are straight. 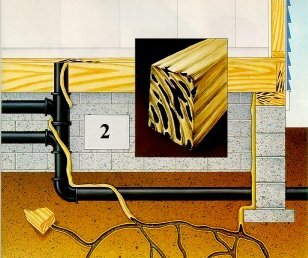 By building ingenious mud tubes, termites can cross many feet of concrete, brick, cinder block, treated wood, or metal termite shields, making it possible to reach the upper floors of a structure. 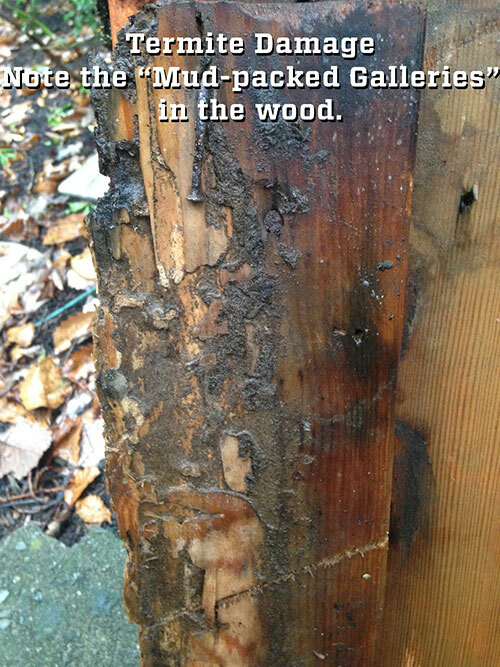 Termites eat wood from the inside out, avoiding detection for years while doing extensive damage. Termites are social insects that live in organized colonies similar to a beehive. Termite nests are highly-structured communities where termites are split into two major groups according to their reproductive ability. The sterile termites are wingless blind workers and soldiers who stay underground to do the heavy lifting such as foraging and nest-building. 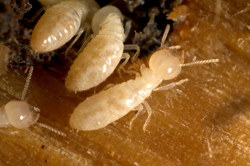 Termites are often called "white ants" because of their pale color. Termites are grouped according to what they eat: grass-eating, subterranean, soil-feeding, drywood, and dampwood termites. 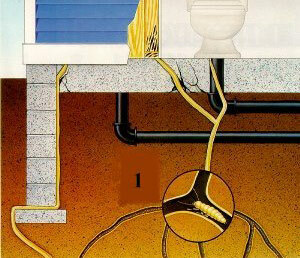 Subterranean and drywood termites cause most of the damage to homes and buildings. Cowleys offers the best termite control solutions for an existing infestation, as well as termite protection to help keep them from coming back. Contact us today to schedule your termite inspection, which includes a free detailed cost estimate on the termite treatment plan that's right for you. We're the experienced termite company and pest control specialist in Edison, Woodbridge, Lakewood and throughout Mercer, Ocean, Monmouth, Middlesex County, New Jersey.